I am in Yokohama, Japan visiting my family. Since having a New Year is important part to Japanese, people decorate materials in front of house, shrine, and temples. Trees on my family's garden were nicely trimmed by a gardener. Now ready for the New Year! Happy New Year. Applying natural dyes are so fun! Take a look pictures. Leaves and branches of Apricot tree from our yard created lovely yellow on silk. It is buttery and honey like yellow. While simmering, the smell was sweet. We experienced coffee, onion skins, tea, and logwood in the class of Origami Shibori with natural dyes at Evanston Art Center(847-475-5300). Works are by Sara, Donna, and Dixie. New class will start Oct. 22 (TH). Hope you can join. The class is Nui Shibori with natural dyes. I truly enjoyed teaching Katazome (rice paste resist with natural dyes and pigments) class this summer. It was intense; all students worked early morning till late night. Luckily the weather was sunny and warm. Natural dyes need such kind of weather. We used traditional Japanese fabric stretchers (shinshi and harite). We started to cut stencil paper with knife. Cook rice paste and spread out through stencil on fabric. After drying the rice paste, paint. We used fabric paints first, then sumi ink and natural mineral pigments from Japan. Finally, applied natural dyes, such as madder root and cutch with alum and iron mordents. We also used natural indigo making a dye vat. Wish we could have much time to combine indigo and other natural dyes. It creates beautiful shades. Well,,,next time. 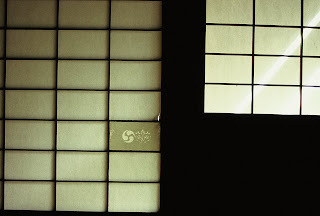 Answer from Akemi: Place special silk gauze "sha" (or net) on already cut out your stencil paper. The net is the same size or slightly over as your stencil paper. Face up. Dilute the acrylic paint with water to flow smoothly. Coat acrylic paint with a flat brush on the net and stencil paper. Brush from the center to the edges. After 5 min. - 20 min., flip over up side down, and remove bridges with knife. So, the timing is important. Not too wet, not to dry. If the paint is completely dry, it is hard to remove the bridges from the net. If too wet, move the net, stick on your fingers,,,it makes mess. If paint is thin coat, brush again with acrylic paint after cutting bridges. NOTE: the above is for synthetic stencil paper use. If you use a traditional stencil paper, "SHIBUGAMI", the procedure is different. The followings are some questions from my former students. I think it is good to share information because some of you might have similar problems. 1. Recently I use silk organza. It can be applied 2 or more layers to print at the same time. I like medium weight of sateen. Wool & silk blend also work beautifully. Row silk doesn't work. 2. Stiffness comes from starch of rice paste (sweet rice flour). Dip in a warm water to remove starch. Be careful! If color comes out, take out the fabric immediately and put it in a cold water. Repeat. Then apply vinegar or hair conditioner. It makes soft. It was not enough rinsing if the fabric is stiff. 3. I don't seal the fabric. I asked to be framed when the art work placed in a dinning hall. 1. Do you mean "paint" as color rice paste? I don't exactly understand the situation. If so, the net side is up. Press slightly harder. So, color rice paste goes through the net. If paste is hard, it leaves a net mark on the fabric. 2. You are right. Depending on fabric, the impression is very different. Therefore, I use it as a metaphor. I interlaced sateen silk and hand woven row silk on my art work. It shows different colors based on "different (cultural) back grounds. In addition to silk, choosing colors, thickness, combination of colors, etc. makes impression different. I think it makes the image richer and more interesting. Suggestions: -Use one type of silk for a while. You will get familiar of the silk. -Limit your color pallet, maybe 6~8 colors. If some colors are too aggressive, mix small amount of dark color or black to tone down. -Keep color sample and recipe. Laura's house in New Harmony was truly lovely! It is a country setting with a large vegetable garden. Her inspiration comes from those vegetables, fruits, bees, gardening tools, flowers and plants. Because of her terrific sense of design and imagination, she created wonderful art work, and they fit nicely in her home with warm atmosphere. Her husband, Ben is a great gardener and organize placements so well. I was impressed by his sharp eyes in 3D (of course, he is an architect and teaches at the school of the art institute of chicago). She invited interesting people for Rowland at her house. Tons of delicious vegeables from their garden. What a treat!!! It was precious and unforgettable time of my stay in New Harmony. I went to see Rowland's show in New Harmony. I also wanted to see Laura (Foster Nicholson) and her home. I liked a lot about Rowland's work which are from 3 elements; lined millions of felted stones on the wall, indigo dyed fabric panels, and indigo plants on the floor. His indigo colors are so transparent even it is deep. It tells us a gradual color change of indigo. "Katagami with Color Rice Paste"
I taught "Katagami with Color Rice Paste" at the Int'l Surface Design Assoc. Conference in Kansas City last week. The process: cooking rice paste, mix dyes into rice paste, cu-out stencil paper for design, then spread color rice paste through stencil paper. Then put all over color rice paste as a back ground, roll it and steam to color set. It resist and color at the same time. It is complicated process based on traditional Japanese Katazome, and all students did really well!!! Although it was a short time, only four full days, the result was impressive. We found a dog last night on a street. He was sweet and very nice dog; Pitbull, maybe 2 yrs old. He had a collar, but no tag or chip (we took him to a vet). Since we have our dog Maxine, we were unable to keep him. We made many phone calls, asked neighbors and friends. We took him for a walk if someone might be looking for. Even he might have known his home. No chance. Finally, we called Chicago Animal Control. The dog was taken. He is available until April 23 (TH) at the Animal Control office. Please contact if you are interested. He is a good boy and truly has a good nature. Wish we could keep him. Miss him. in some reasons, images did not show, so I will try again. These images are my inspiration. I took pictures at Mount Koya, Japan. Shoji screen is repaired by lovely way. Hole became a nice decoration. My grandmother used to do it whenever her grand daughters poke fingers through shoji paper. Another photo is taken at a old Bhuddest temple at Mt. 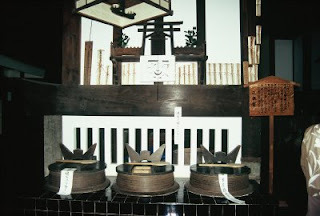 Koya. Because of use of fire, a kitchen was considered "holly place where gods exhisted, and family members prayed the end of year to thank and celebrated a new year putting a cut out stencil paper. Do you see it? I haven't discovered how to communicate yet when friends send me comments. Also, please forgive me many English mistakes in my writing. I will try to study harder. I appreciate all of your warmth and patient. Indigo is a life long work. When I see the old fabric, "CHAYATSUJI" made in the early 17th century, it make me feel I am very happy to know how skilled artisan exsisted. I don't think I can remake (no way!) it, even I don't want to. I want to keep it in my mind as a guide, and make my own work now I live. It will be a big challenge, but I love doing it.